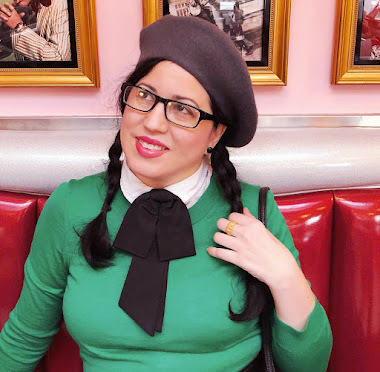 Continuing my vintage adventures with Beccie from Sew Retro Rose, we made it a point to swing by to Coney Island because as you already may know from my last post it was a hot spot for New Yorkers from the late 1800's until the 1960's. Coney Island isn't the best neighborhood in the world and the best time to be there is in the daytime. Slowly but surely things are changing there and I was glad to see that. The first thing our eyes fell upon was the iconic Coney Island Cyclone, which was opened in 1927. I do not like heights but when I was 19 I decided to kill my fear and get on the cyclone. Very bad idea. Very. After being in awe of the Coney Island Cyclone we walked around a bit and admired the sites. There are parts that are quite colorful and new shops opening up everywhere like the one below called It's Sugar. They had heaps and heaps of candy treats and retro goodies everywhere. I loved it! Then we walked across the street to the infamous Nathan's Famous which is the original Nathan's set up in 1916. The hotdogs are divine and they still carry their original orange drink. Its very light and no fizz, sort of like a lighter version of Tang (a orange powder drink). The last bit of our morning at Coney Island was walking the boardwalk. It was like walking on a piece of history. Back in the 1920's and 1930's that beach behind me used to be jam packed. It isn't as much today but maybe one day it will get better. The photo above was taken by my wonderful husband who captured the moment right before we made our little mini video on Instagram. If you would like to see it, take a peak HERE. We ended our time at Coney Island as goofballs and friends. It was a lovely time we spent together but it isn't the end! More to come! Have you been to Coney Island? If so, have you gone to the beach or the cyclone? What a fun day! There is actually another Coney Island near Cincinnati OH and I've been to that one but I've never gotten a chance to go to the original. You both look like you had such an awesome time together! I have visiting Coney Island and riding the Cyclone on my bucket list. One of these days, it'll happen! You look amazing and seem that you had a lot of fun!!!! You two lovely ladies look like you had a blast. Thank you for sharing and letting those of us who have never been to Coney Island live vicariously through you. Aww, how seriously, fabulously, heartwarmingly lovely!!! It's evident in your smiles and shared bliss what a truly awesome day you both had. I'm thrilled for you and hope you two are able to meet up again in the future for another wonderful vintage blogger excursion or two. What a fun time! I do wish they would restore it to its former glory (bringing back all the retro goodness from the pre-1960's era). I love hearing about Coney Island (and similar theme parks in those days) and seeing it recreated in old movies.